Oh, the things I stuff into my purse in preparation for a trip. 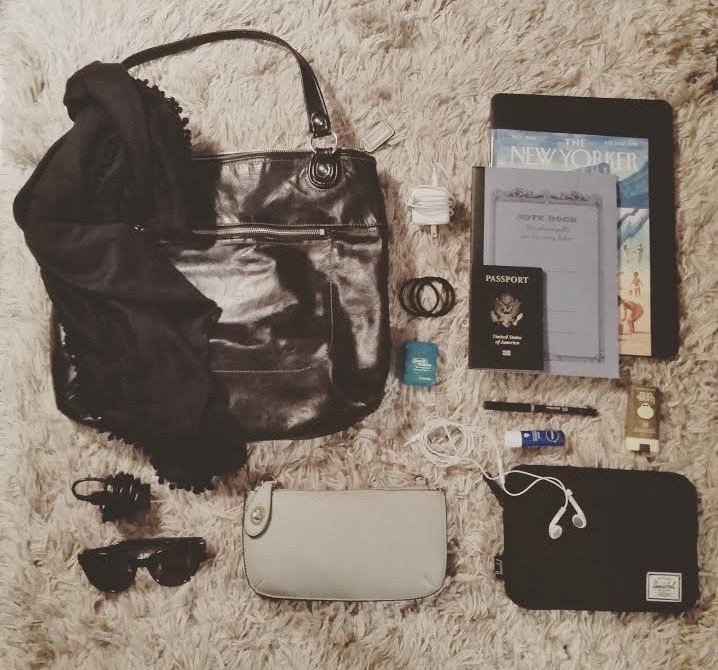 I have one purse that I consistently use for travel because of its pocket surplus. It may just be me, but as I approach airport security I’m always filled with dread and wishing I could grow an extra six arms and channel Ganesha for the experience. Particularly because I’m almost always wearing boots, there’s never quite as much time as I need to shed my shoes, scarf, belt, jewelry, what have you, and figure out what in my bag requires its own special compartment on the conveyor belt. I regard this frantic airport production as a given at this point, but I’ve always wondered, how can this possibly work for anyone without a thousand pockets (e.g., a man)? Sometimes I consider carrying a diaper bag. No, I don’t have children. Is it helpful to travel without a purse in the interest of carrying less? I typically bring my laptop in my purse, so that it’s accessible and doesn’t get crushed in my luggage, but other than that my bag seems to be filled with a whole host of things I’m not sure I’ll need. These items often include, but aren’t limited to, sunglasses, sunscreen, chapstick, hand lotion, two wallets for separate things, a notebook, a pen, a travel guide, and the kitchen sink, and I find that it’s impossible until I reach my destination to determine what’s superfluous. Does having fewer pockets minimize pressure to bring things along that you probably won’t end up needing? Possibly… but purses add style. It’s an apparent lose-lose.